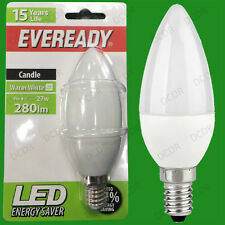 2x 4W (= 27W) Eveready LED Bougie Ampoule. Ultra Low Energy Power Saving. Petit Edison Screw Cap (SES) [E14]. Bulb Type LED. Unit Type Unit. Room Dining Room. Room Children's Playroom. Room Children's Bedroom. 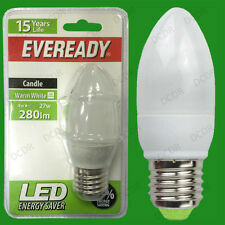 2x 4W (= 27W) Eveready LED Bougie Ampoule. Ultra Low Energy Power Saving. Bulb Type LED. Room Hallway. Room Garage. Room Dining Room. Room Children's Playroom. Room Children's Bedroom. 8x 9W (= 45W chacun) Low Energy CFL. Edison Vis (ES) [E27]. Socket E27. Bulb Type Low Energy CFL. Unit Type Unit. EAN Does not apply. Unit Quantity 8. Économie d’énergie Mini Lampen. 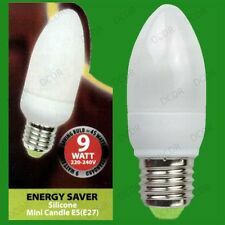 6X 7W basse énergie CFL D'économie d'énergie Mini Candle Light Bulbs. Bulb Type Low Energy CFL. Unit Type Unit. 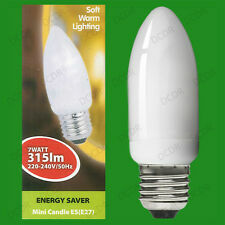 Type Energy Saving Bulb. Room Dining Room. Room Children's Playroom. Room Children's Bedroom. 10x 9W (= 45W chacun) Low Energy CFL. Edison Vis (ES) [E27]. Socket E27. Bulb Type Low Energy CFL. Unit Type Unit. EAN Does not apply. Unit Quantity 10. Économie d’énergie Mini Lampen. 8x 4W (= 27W) Eveready LED Bougie Ampoule. Ultra Low Energy Power Saving. Bulb Type LED. Room Hallway. Room Garage. Room Dining Room. Room Children's Playroom. Room Children's Bedroom. 4x 7W basse énergie CFL D'économie d'énergie. Baïonnette Cap (BC) [B22]. Socket B22. Features CFL. Bulb Low Energy CFL. La forte puissance d’énergie toutes les lampes à économie est beaucoup plus faible que l’équivalent classique ampoule, donc coût inférieur par heure. 6X 9W (= 45W chacun) Low Energy CFL. Edison Vis (ES) [E27]. Socket E27. Bulb Type Low Energy CFL. Unit Type Unit. EAN Does not apply. Unit Quantity 6. Économie d’énergie Mini Lampen. 1X 9W (= 45W chacun) Low Energy CFL. Edison Vis (ES) [E27]. Socket E27. Bulb Type Low Energy CFL. Unit Type Unit. EAN Does not apply. Unit Quantity 1. Économie d’énergie Mini Lampen. 2x 9W (= 45W chacun) Low Energy CFL. Edison Vis (ES) [E27]. Socket E27. Bulb Type Low Energy CFL. Unit Type Unit. EAN Does not apply. Unit Quantity 2. Économie d’énergie Mini Lampen. 1x 4W (= 27W) Eveready LED Bougie Ampoule. Ultra Low Energy Power Saving. Edison Screw Cap (ES) [E27]. Bulb Type LED. Room Dining Room. Room Children's Playroom. Room Children's Bedroom. Room Bedroom. 6x 4W (= 27W) Eveready LED Bougie Ampoule. Ultra Low Energy Power Saving. Bulb Type LED. Room Hallway. Room Garage. Room Dining Room. Room Children's Playroom. Room Children's Bedroom. 6x 4W (= 27W) Eveready LED Bougie Ampoule. Ultra Low Energy Power Saving. Petit Edison Screw Cap (SES) [E14]. Bulb Type LED. Unit Type Unit. Room Dining Room. Room Children's Playroom. Room Children's Bedroom. 10x 4W (= 27W) Eveready LED Bougie Ampoule. Ultra Low Energy Power Saving. Bulb Type LED. Room Hallway. Room Garage. Room Dining Room. Room Children's Playroom. Room Children's Bedroom. 4x 4W (= 27W) Eveready LED Bougie Ampoule. Ultra Low Energy Power Saving. Bulb Type LED. Room Hallway. Room Garage. Room Dining Room. Room Children's Playroom. Room Children's Bedroom. 4x 4W (= 27W) Eveready LED Bougie Ampoule. Ultra Low Energy Power Saving. Petit Edison Screw Cap (SES) [E14]. Bulb Type LED. Unit Type Unit. Room Dining Room. Room Children's Playroom. Room Children's Bedroom. 12x 4W (= 27W) Eveready LED Bougie Ampoule. Ultra Low Energy Power Saving. Bulb Type LED. Unit Type Unit. Room Hallway. Room Garage. Room Dining Room. Room Children's Playroom. 8x 4W (= 27W) Eveready LED Bougie Ampoule. Ultra Low Energy Power Saving. Bulb Type LED. Unit Type Unit. Room Hallway. Room Garage. Room Dining Room. Room Children's Playroom. 10x 4W (= 27W) Eveready LED Bougie Ampoule. Ultra Low Energy Power Saving. Bulb Type LED. Unit Type Unit. Room Hallway. Room Garage. Room Dining Room. Room Children's Playroom.